The first abbey church was established in the 10th century, but the present Gothic structure was begun in 1245 by Henry III and has been the burial place of Britain�s monarchs ever since. 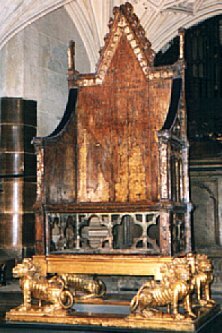 Every monarch since William the Conqueror in 1066 (with the exception of Edward V and Edward VIII) has been crowned in the Abbey. The Lady Chapel or Henry VII�s chapel was begun in 1503 as a burial place for Henry VI. 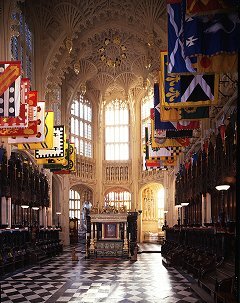 Behind the Altar are the graves of Henry VII and his queen, Elizabeth of York. Their monument is by the Italian sculptor Torrigiani. The tombs of Queen Elizabeth I (d. 1603) and Queen Mary I (d. 1558) and Mary Queen of Scots (d. 1587) are also located in the chapel. The 14th-century portrait of Richard II, located in the chapel, is the oldest known image of an English monarch painted from life. Poet�s Corner is located in the South Transept of the Abbey. 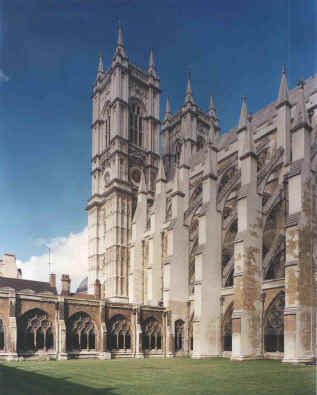 The first poet to be interred here was Geoffrey Chaucer who had been Clerk of Works to the palace of Westminster, and after Edmund Spenser was buried nearby in 1599, the tradition developed which honored great literary figures with a grave or monument at Westminster. Those buried here included the poets John Dryden, Alfred Lord Tennyson, Robert Browning, and John Masefield and the writers Samuel Johnson, Charles Dickens, Richard Brinsley Sheridan, Rudyard Kipling, and Thomas Hardy. Those memorialized included William Shakespeare, John Milton, William Wordsworth, Thomas Gray, John Keats, Percy Bysshe Shelly, Robert Burns, William Blake, T.S. Eliot, Gerard Manley Hopkins, Jane Austen, Sir Walter Scott, and the Bronte sisters. An interesting sidelight of the Abbey is the Jerusalem Chamber, one of two rooms added to the lodgings of the medieval abbots of Westminster in the 14th century. King Henry IV, who was planning a trip to the Holy Land, suffered a stroke while praying at St. Edward�s Shrine and was brought to the room and placed by the fire where he regained consciousness. According to the chronicles, Henry asked where he was and when told he was in �Jerusalem,� he knew his death was imminent since it had been prophesied that he would die in Jerusalem. Shakespeare relates this story in Henry IV, Part II. The chamber was also the meeting place of the authors of the King James� version of the Bible.